That was asked by one of my kids when I made my family linger at some London memorial while I read yet another inscription. It was a fair question; not everyone — especially teenagers — shares my fascination with the final resting places of historical figures. 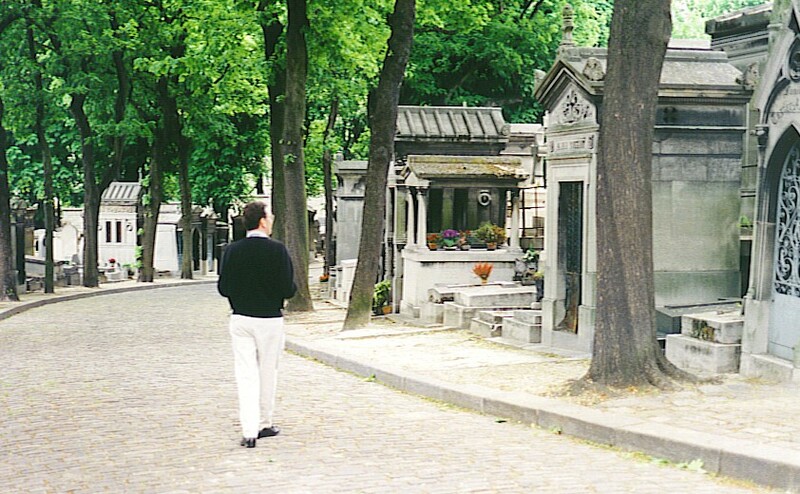 A lot of people do seem drawn to such sites, though; one in Paris, called Cimetière du Père Lachaise, has hundreds of thousands of visitors every year. It is believed to be the most-visited cemetery in the world (although I’m not sure who is actually keeping track of attendance figures at cemeteries). Its location in the 20th arrondissement — northeastern Paris — might seem inconvenient, but there are two or three Métro stations within easy walking distance of Père Lachaise. Well, it’s not as easy a walk as, say, from the living room to the kitchen, but the stations are within a few hundred yards of an entrance to the cemetery. It’s probably a coincidence that there are flower shops near each entrance. Most of them sell maps of the cemetery for a few euros, but as I recall, there was one spot just inside the main gate that supplied free maps, which come in handy. Artists: Delacroix, Modigliani, Jacques-Louis David, Seurat, Rosa Bonheur, Géricault, Ingres, René Lalique (the glass designer), Corot, Max Ernst, Pissarro. Writers and Poets: Molière, Marcel Proust, Richard Wright (Native Son), Collette, Balzac. Performers: Sarah Bernhardt, Marcel Marceau, Edith Piaf, Maria Callas, Isadora Duncan, Yves Montand, Simone Signoret. Composers: Georges Bizet, Paul Dukas, Francis Poulenc, Rossini (he has actually been relocated to Florence, but his crypt is still here). Of special interest at Père Lachaise are: The remains of star-crossed lovers Abelard and Heloise, which were transferred here in 1817, several hundred years after they died. Frederic Chopin‘s tomb stands out because of the many floral tributes and candles left by his legion of admirers. The great composer’s body is here, but his heart was taken to his native Poland. The tomb of rock singer Jim Morrison (The Doors) attracts many offerings from his fans, too, but a lot of it looks like debris: scrawled notes, ticket stubs, photos, articles of clothing and other random items are strewn there. Gertrude Stein and her partner Alice B. Toklas share the same tombstone; Stein’s name is on the front and Toklas’s is on the back. The Art Deco monument to Oscar Wilde was regularly “vandalized” with lipstick kisses put on it by visitors, but cemetery officials recently gave it a thorough cleaning and blocked it from potential smoochers with a glass barrier. Scientists and politicians and philosophers and engineers are buried in Père Lachaise as well, and of course some eminent composers and artists are buried elsewhere in Paris. If your time in the City of Light is limited, though, Père Lachaise is the best place to go if, like me, you feel compelled to see the tombs of famous dead guys. This entry was posted in Travel and tagged Paris, Pere Lachaise Cemetery. Bookmark the permalink.